Tomorrow, Publishing Perspectives Editor in Chief Edward Nawotka and I will host a live Twitter chat on this week’s Ether topic(s) at 4 p.m. GMT / 11 a.m. ET / 8 a.m. PT. We’ll use the hashtag #EtherIssue as we do weekly. 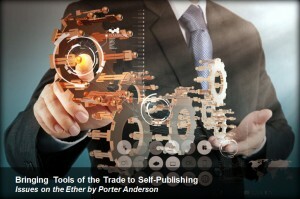 Join us and watch for @PubPerspectives and @Porter_Anderson on Twitter. LONDON — Short of a chance to back the car over Robert McCrum just outside the Hospital Club in Covent Garden, it’s hard to think of a more auspicious debut for Authoright’s new London Author Fair. I’m teasing about McCrum, of course—at least, I hope I am—and his article in the The Guardian’s Observer actually is dated March 1, the day after the February 28 debut of London Author Fair. It’s headlined From bestseller to bust: is this the end of a author’s life? and it’s an interpretation of how several traditionally published authors are challenged to keep afloat in the double-whammy of economic downturn and publishing’s digital disruption. Much too dire! Far too depressing! Sensationalized and downbeat! Negative, negative, negative! Many in the writing and publishers’ community are crying foul and saying they’re unhappy to see things painted in such faltering light. The Robert McCrum piece risks sounding a little bit… whiny, and coverage like this makes it sound as if all of us engaged in the book industry are collectively some sad, fat, old dodo stumbling helplessly about on the forest floor waiting for extinction. Let’s, instead, focus on telling people what great stuff, new and old, we have for them to read, and make it easy for them to find it, buy it, and tell other people about it. Surely, there’s a difference we must grant McCrum between the journalistic role of a feature’s focus and the promotion of a digitally invigorated industry’s self-image, eloquently handled by Wilson. Indeed, perhaps the ballast of negative commentary could help counter giddier excesses of optimism. Not for nothing do we warn authors against thinking that the “outlier” successes can be the norm. Somewhere between these partial views of the author and publishing business lies the reality: but it is not any longer a model fixed in aspic, which is perhaps why so many look to the recent past to explain it, or choose to invent a future that has not yet arrived. Still, the community has seemed little interested in embracing even a jot of the dark side, piling on to McCrum with gusto, although in past outings, they’ve liked him when they liked him, I’ve noticed. 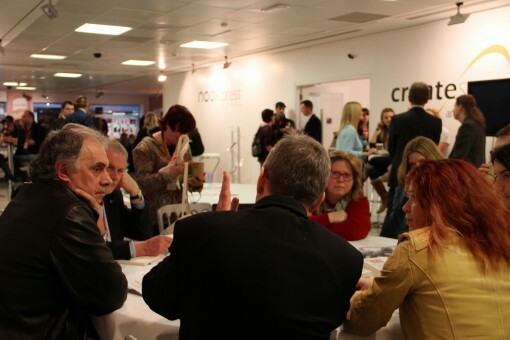 And we London Author Fair-goers and speakers enjoyed an unmistakable exercise of the positive, can-do dynamic. Which does, yes, beat complaining. It buoyed Friday’s daylong conference from morning coffee to evening wine. 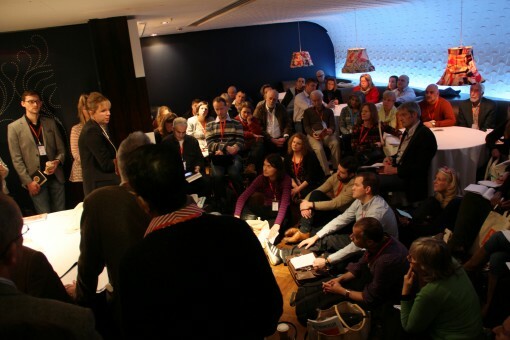 The event, sold out a week prior to the date, was attended by close to 300 people who chose between more than 21 workshops, nine seminar sessions, a battery of agent-pitching sessions, all set up with free author photos, and a welcome reception at the end of the day. The entire affair was presented with knees-up professionalism and moved along on time through its sophisticated tour of fundamental matters of the day. 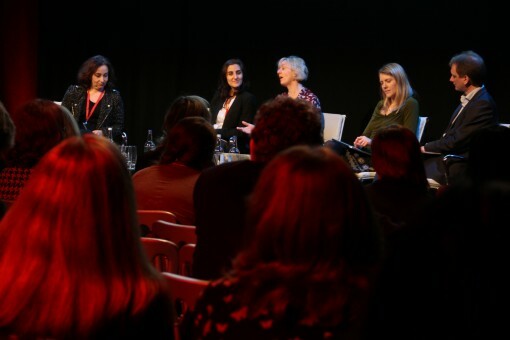 Having chaired four of its seminar sessions—situated in a comfortable, large space below ground with great amplification and dramatic red lighting—I can tell you that the audience paid close attention to what was being said. Not only were they listening more attentively than is always the case at these events, but they also had good questions to put to the panelists. In the seminar room, topics were framed in the glowing light of their larger issues: entrepreneurship; the industry’s travails; marketing; the centricity of good content; distribution; and discoverability. 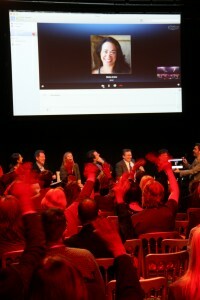 These sessions culminated in a late-day brain-storming session in which speakers pitched their visions of how things might look in 2020, led off by self-publishing icon Bella Andre, who spoke with the gathering on Skype from her home in California. Cambridge sociologist John Thompson and author of Merchants of Culture told Business of Books panel chair Philip Jones of The Bookseller: “The only thing for authors to do in this situation is to gain knowledge about this industry…understand it.” And there they were, those authors, doing just that. Wiley’s Holly Bennion was there to explain, “The role of the publisher is to drive revenue…As a commissioning editor, my responsibility is for the P&L (profit and loss) of every book” she handles. 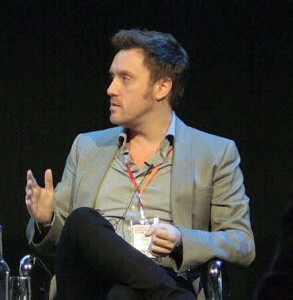 Another author, Matthew Cain, told the attendees that in learning how to brand yourself, “I do think you need a really simple proposition if people are to get their heads around” your work and career. Patrick Brown, Goodreads’ able spokesman revealed that the mammoth reader-recommendation and social site now has more than 30 million reviews logged into its system. The goal, he said, is for a writer’s readers to become that author’s sales people. Authoright’s Radford opened the day by quashing any confusion that we’d see a battle of the “tradpubs” vs. the “selfpubs,” as we tend to short-hand the major camps on Twitter. Instead, she announced, “This is an event for all authors.” And many of us on the stage chatted among ourselves during the day about what a cooperative, cohesive spirit there was among the attendees. 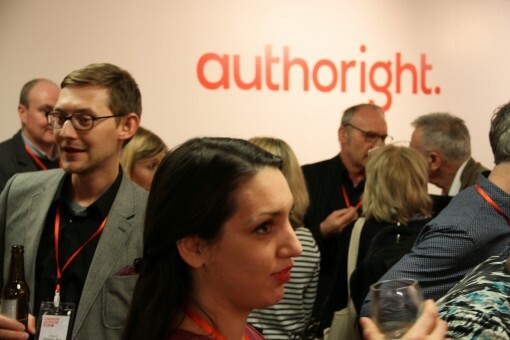 Authoright’s Gareth Howard had opened the day by saying “This is a golden age of authorship.” And his company proceeded to produce the kind of day that makes you believe that kind of statement: frank but confident, straightforward but hopeful. It’s amazing working with really savvy entrepreneurial self-published authors…We need to respect that. We need to complement that. And we need to offer more than that….be really strategic and work out the best way to get the material to the right people at the right time. A couple of years ago, you’d have laughed me off the Publishing Perspectives site here if I’d told you that those words were spoken at the end of the week in London by an agent of a leading literary house. But that’s Hellie Ogden of Janklow and Nesbitt. And those were some of the very first comments she made at London Author Fair. For my money, the “Agents of Change” was one of the most revealing sessions of this good day, for a glimpse of where things are headed. Here were the front line of “gatekeepers” in the traditional model gathered to talk about their own and authors’ experiences and their implications—not only for authors but also for themselves, for their own community and trade. What came across was an adamant interest in authors’ new efforts to find their footing and a real interest in their work in a widening potential of platforms, formats, and arenas. 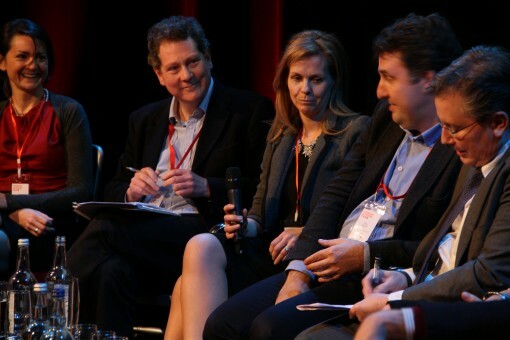 Let me give you some of the comments we heard during this session which I was lucky enough to have a chance to chair with Andrew Lownie of Lownie Literary; Oliver Munson of AM Heath; Ogden; and Gordon Wise of Curtis Brown. First, a quick counter from Lownie to Ogden, not at all in the spirit of his interest in an author’s work but—in answer to my question to the panel—how he might see an approach from a writer of self-published work. Following Ogden, who has been agenting for some five years, Lownie spoke from his own experience of three decades. He is counted by Publishers Marketplace the top-selling agent in the world across all categories with some 55 or more deals recorded in the US and UK in the past six months. We get about 100 submissions a day and almost all of those submissions come from people who haven’t been self-published. In fact, I think we’d look quite carefully at something that had already published because we would feel it might be quite hard to take it to the next level unless it had been very successful already. I think an agent clearly manages careers and expectations and I think there’s a different set of expectations that you have to manage when someone has been self-published previously, particularly if they’ve been enormously successful. The number of people we’d consider to be enormously successful is quite slim, and that’s why we can name most of them by name. If this were happening every day, we wouldn’t be able to do that. Someone who’s put themselves through the fire of that test (self-publishing)…they may arrive with a few of the rough edges knocked off, which I think might be quite appealing to a publisher…(He concurred with) the point Hellie (Ogden) made about everyone needing to up their game, including the authors. Because nobody is sitting around waiting for a book to happen…Books are one of a number of pieces of entertainment competing for our time…A book really has to earn its keep. I think the future is really exciting. You hear so much that’s down-and-out about the industry and lots of conversation about pricing…but we’ve seen lots of debut novelists coming up…The publishing industry will be where we put it…we need to be proactive, not reactive…savvy about how we deal in content and where we’re putting it. 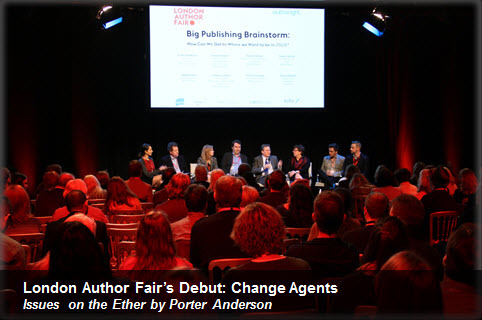 What I’d say is that we (agents) need to be more like publishers. We need to be going out and packaging things, creating links with newspapers or other organizations…in a sense, things that publishers used to do, agents will have to do…I think there will be much more partnership, much more like celebrity and sports agents, having to look at a much wider range of things that we do. I think we’ll have to look at the way the remuneration of agents is handled…we see the rise of the lawyer-agent coming in and taking fee for books that are probably quite easy to sell…retainers, tapered commission, an a la carte menu for authors where agent will do some of their books, not all of their books. I became an agent because of that kind of possibility…As an agent, if everything I do now went out of fashion tomorrow, I could have recruited a new client list by next January…Agents can always be flexible. I find the mix of businesses I do dramatically changing from conventional deals to branding and endorsement and that kind of thing. Successful agents will ride these changes and harness these interesting options as they come along. It’s about being flexible, being fleet of foot, being a bit crafty when you have to be…we work for agencies which are a hundred years old and we need to work now to safeguard our livelihood so the hundredth anniversary becomes the two-hundredth anniversary. You have to be on it. The Authoright team plans to make the London Author Fair sessions available as soon as possible on its sites so you can take in this session and others in their entirety. For now, I’ll leave you with these thoughts from a good conference, a warming dialog that was almost entirely bent on finding, in every part of the day’s discussion, common ground, a way forward, and shared understanding. What we do as an agent, and what we’ll always have to do, is find amazing stories and the best way to give people those stories…if you’re a new (author)…to have that agent to help you navigate during that time—to look out for you and be a buffer between the creative world and the business side if it—is essential. How do you see the role of agents today? Do you agree with those who say they’re essential to progress in a writer’s career? Are there ways in which you think agents’ efforts could work against an entrepreneurial author’s fortunes? Is it worth trying out the responses of agents to your submissions before going it completely alone? 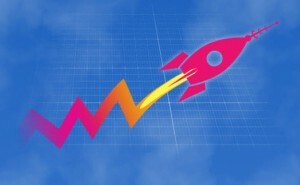 Or do you think that even the feedback from the traditional industry is of too little use to you? We’d love your input on Wednesday at 11 a.m. Eastern, 8 a.m. Pacific, 4 p.m. GMT on hashtag #EtherIssue — see you then. As you’ll recall last week, we talked about how the book technology company Vook is launching a new service, Author Control, for entrepreneurial writers. You may have noticed a few mentions of data recently? —as in, we pretty much don’t have any in publishing, just partial estimates of one element or another of the market? Well, Author Control is designed to address that for authors by tracking their book sales across multiple platforms and creating customized reports with graphics. Today’s the day for that launch, and as we put the Ether to bed, the new dashboard is being rolled out with an offer to try it free, should you be inclined to give it a look. Battle-testing sounds about right for the industry! the industry! when you think that accurate, precise data about sales under the control of the author, not a publisher or other go-between, could eventually be precisely what gets us past the data-blind contentions of recent months. The company is working in the States with Boston’s Grub Street program; the UK-based Alliance of Independent Authors (you know them as ALLi); and Romance Writers of America. Literary digital author Kate Pullinger in London and mystery specialist Elizabeth S. Craig in the US are two key road-testers, as well. 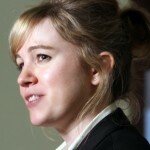 < And in our preparatory column to last week’s Issues on the Ether column for our #EtherIssue live discussion, Bringing Tools of the Trade to Self-Publishing, we askwed our readers to talk with us about what tools entrepreneurial authors need most; to what degree those tools can be as much of a burden as a help if they slow down writers with steep learning curves; how well the commercial world seems to be responding so far to the needs of entrepreneurial authors; and what kind of results they’re seeing from their own experiences and experiments with new tools. As usual, the Publishing Perspectives community was anything but shy, and we had a great, rollicking conversation. @Porter_Anderson @CarlaJDouglas @CarolBuchananMT @goodreads I like Goodreads for what I learn from it about what readers think. Author Lucas Bale echoed the going wisdom (shared by Bell) that the best promotional copy is that of more books. Readers like authors to have inventory at the ready. @CKmacleodwriter @Porter_Anderson @CarlaJDouglas @pubperspectives Yes, they built a great product actually… Why did it go down?